Having to look through a tremendous amount of different components to assemble the perfect fishing combo is something which requires both time and effort. With this in mind, we are here to provide you with a convenient alternative. Instead of having to go through the aforementioned hassle, we want to provide you with a fishing combo which is pretty much ready to use. 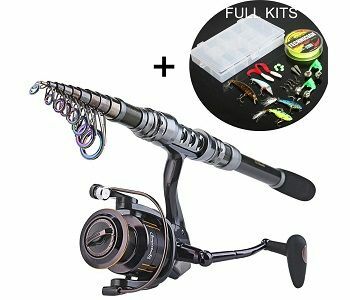 This is a fishing combo which consists of a collapsible rod and a reel, perfect for different types of fishing undertakings. As a matter of fact, this is the first thing that we are going to have a look at right now. The first thing that you need to be well aware of when it comes to this particular unit is its designation. Now, you would be capable of choosing between different rods and reels but there are a few integral components that you can rely on, regardless of your particular choice. Right off the bat, the material of the fishing combo is particularly extruded – it’s made out of graphite which is reliable while at the same time light weight and high-end in terms of performance. This is the main reason for which you would be capable of going for some moderately big fish, even though you should be aware that regardless of the size, this rod is not suitable for truly heavy and big game. You should better keep it relatively moderate in terms of weight and don’t target fish more than 7-8 kilograms. The rod is best suited for onshore fishing, rocks, trips and vacations as well. Now that we are aware of the main designation of the fishing combo, let’s turn our sights towards the different components. There are two major ones that we have to account for when it comes to it – the rod and the reel. The fishing rod comes in a few different specifications that you can choose from depending on your own personal preferences. It’s impossible to encompass them all, so let’s have a look at the essential overall capabilities which define the rod itself, without minding the particular specifications of the different models. Right off the bat, the rod is made out to be strong and durable, while at the same time it comes with tremendously interesting features to promote good elasticity as well as strong and reliable capacity. 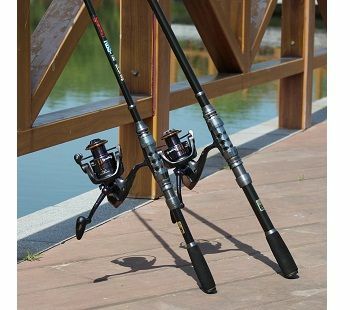 The entire blank is made out of carbon fiber, which is a very reliable material known to provide the fishing rod with a lot of durability as well as flexibility. Furthermore, the collapsible design is going to ensure that you can easily carry the rod around with you, regardless of what your destination is. This is also something particularly convenient. You can easily store it in the back of your trunk. You can even carry it in the overhead compartment of an airplane if your fishing trips requires air travel. All in all – this is something particularly convenient and it’s definitely going to provide you with a lot of convenience. The reels are also of significant quality and they are definitely up to the highest industry standards. The first and foremost thing about them is the extruded spool. This is undoubtedly something that you might want to take into account. The spool will provide you with reliable performance while at the same time keeping the overall weight properly reduced. 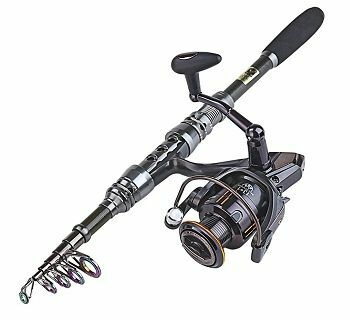 The ratio of the reel is 5:1, depending on the model that you choose. All in all, the units are well-rounded but you shouldn’t expect miracles from them. This is something that you should take into account. The main designation of the entire combo is to provide you with a comprehensive solution for your traveling undertakings. You shouldn’t worry about having to spend an excessive amount of time wandering around different specialized shops. Don’t worry if you don’t have the necessary expertise and knowledge as this is a ready-to-go unit which will allow you to walk out the store, get some bait and cast it directly. This is definitely something that you want to take into account. If you don’t have time to spare looking for different components individually or you don’t have the desire to do so because you are uncertain of what to choose, you’ve stumbled upon the right place. This is a great entry-mid level rod which will be perfect for a range of different undertakings.